This entry was posted in Writing and tagged my books, The Falcon Throne, The Tarnished Crown series by Karen Miller. Bookmark the permalink. I love a good inland sea or any variation thereof! Heh heh! Any hassles with the map are all my fault. I will say this — I didn’t expect, and that’s the beauty of discovery — that having the map to look at would help me in storytelling ways. I don’t normally work like that, so it’s a good lesson. What a great map! So many places to explore – what does the rest of it look like? Oooooh! more stories to write! LOL! This is why on the whole I don’t like maps. They can short circuit the reading experience! I just finished The Falcon Throne and loved it! When can I expect, broad estimation of course, book two of The Tarnished Crown series to be released in the US? Thank you, Dalton! I am chuffed to bits you enjoyed it. I’m working on bk 2 now, and expect it will be out next year. Sorry to make you wait, but I really need to do it right! I actually found this page whilst Googling about for a map of your Godspeaker trilogy. Does one exist? I’d love to see the relation between the six duchies (oh my, so hard to say ‘six duchies’ without thinking of Fitz in Robin Hobb’s large amazing series), Hekat’s lands and everywhere in between. Maps are weird things. Some people really love them and others … it’s more meh. Have to confess I’m more in the meh camp. But then geography was never my thing! 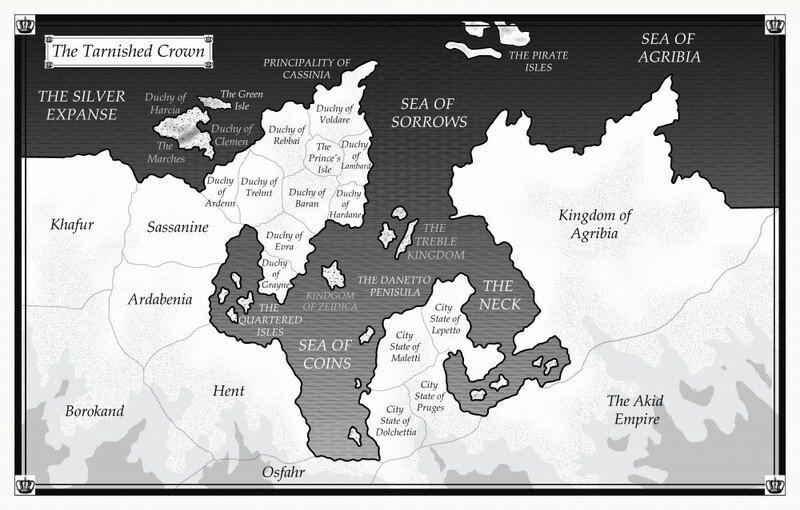 But bearing in mind the complexities of this series, plus the fact that lots of people do love maps, I worked hard on the one for Tarnished Crown. Alas, I don’t have one for the Godspeaker trilogy. I might go back one day … but not until I can breathe again after all the writing I need to do!